Hey guys, wake up to the PODCAST REVOLUTION! It´s changing the way people think and share information all around the world, but most Brazilians have never even heard about this wonderful technology that can change your life. Today is your chance. Let’s talk about podcasts. As previously discussed in the RealLife Lifestyle English Guide, podcasts are becoming more and more important. So what is a podcast? A podcast is a (relatively) new form of digital media that is revolutionizing both how we consume information AND the quality and diversity of the information we accept. The “pod sphere” is the term used to describe worldwide depository of podcasts. Today I’m going to show you how to discover this rich and abundant source of free information in just a few clicks, not only to enrich your life with better information, but also to help you improve your English. 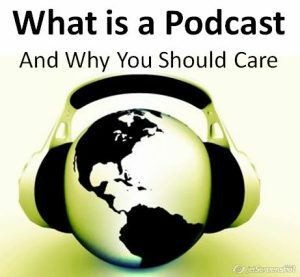 The different types of podcasts, and how they can help you learn English. When and where to listen to them. How you can get started with podcasts. Podcasts with and without apple products. So First of All, What is a Podcast? Podcasts are free, downloadable audio (sometimes video) programs, containing new and interesting information about anything you can imagine. They are created by specialists in their fields, in addition to entertainers, journalists, and even big media outlets. A podcast is like a radio program, but you can download it from anywhere in the world. There are millions of programs to choose from, which you subscribe to, put on your MP3 player, and listen to whenever you want, wherever you want, and with basically no commercials. The point is that you are in complete control of your learning experience. ENGLISH AS A SECOND LANGUAGE PODCASTS (ESL) are podcasts specifically designed for people learning English. ESL stands for English as a Second Language and you MUST use this term when searching this kind of podcast. You must use this term to find these because searching “English Podcasts” will result in podcasts in English and podcasts about English literature. For Brazilians, the only problem is that there are few beginner ESL podcasts in Portuguese. So, it’s more complicated to take advantage of this at first. Podcasts specifically for beginning students is a topic I will cover in a future article. NATIVE ENGLISH SPEAKING PODCASTS represent the great majority of the pod sphere. They are mostly created by native speakers of English for anybody who speaks English. There is no focus on learning English, but rather to spread information, educate and entertain. I use these for entertainment, information, and self-development. NATIVE PORTUGUESE SPEAKING PODCASTS exist and are increasing every day. They are made by Portuguese speakers (mostly Brazilian) for Portuguese speakers. There isn’t such an abundant supply of native Portuguese speaking podcasts as there is in English, but there is plenty of good, interesting information. I use these nearly every day to practice my Portuguese. PORTUGUESE LANGUAGE LEARNING PODCASTS are starting to emerge more and more as people are getting interested in Brazil with the World Cup and Olympics approaching. I listened to these while driving in the U.S. and nowadays I listen to them on the bus. They are great for learning Portuguese. I’ve been listening to podcasts about 3 years now. I listen to podcasts a lot. I like the idea of being in control of the media I consume and mixing it up so I get a balanced diet of information. You will never get that in the traditional mass media. In a world where the rich control your information, with 99% of the mass media in the hands of a small handful of really powerful people, I really need a rich variety of news sources to form my worldview. I live in Brazil, and I listen to them every day, in both English and Portuguese. I listen to podcasts about self-development, spirituality, the news from the United States, Portuguese learning and Brazilian music and culture podcasts. I use podcasts to teach English and I encourage my students to listen to them every day. It helps A LOT! First of all, this is a very personal decision, but I can tell you, based upon my own experience, that there are spaces in my day where podcasts are very convenient. I rarely sit and listen to podcasts at home. So as not to waste time, I’m always doing something else. I’m always looking for these moments. I listen to them on my mp3 player while I run, while on the bus, at home while I’m getting ready in the morning, ironing clothes, cooking and even when I’m cleaning the house. I sometime put them on my alarm clock so I can listen to them for a few minutes before finding the courage to get out of bed (this is an important practice to activate my Portuguese). Think of it like putting your change every day into a savings account that accrues interest. It doesn’t seem like a lot at first, but over the months and years, it accumulates, gains interest, and a few months down the road, you realize that it’s pretty substantial. With consistent, relaxed, daily contact, your English will drastically improve over the months and years. Fifteen to twenty minutes a day is what I recommend. Like anything in life, you won’t notice improvements if you aren’t consistent. A very convenient moment to listen is when you are in your car or on the bus. If you listen in your car and don’t have a very modern stereo system, you might need to figure out a way. This might take some investigation, maybe an investment in a better stereo system, but you can also purchase small portable speakers for really cheap. It’s actually quite simple. Itunes is probably the best program you can find to download podcasts. lthough it’s not necessary, itunes makes things a lot easier. Itunes is a free music program that enables you to surf the “pod sphere” and subscribe to your favorite podcasts. Here’s a quick guide. Download itunes for free. Itunes is an incredibly useful program used by millions of people around the world, and podcasts are just a small part of the program. You can use this for many other types of media too. Podcasts are one of the only free ones though. You can find RealLife English on iTunes here (and download the App). The synchronization of podcasts to your ipod/ phone or ipad is much easier than other MP3 players. This alone is a great reason to consider investing in an ipod, iphone or ipad. If you don’t have the cash or are not convinced, don’t worry because with a little initiative you can listen to the same stuff without all the fancy equipment. itunes is still an extremely useful program even if you don’t have an ipod, iphone or ipad. It just takes a few more steps to put them on your non-apple MP3 player. Instead of easy synchronization from the program to your ipod MP3 player, you have to search for and find the folder that your podcasts are stored in, and then manually put them on your MP3 player. Look for the “itunes” folder on your computer and find where your music/ podcasts are stored. To be fair, itunes isn’t the only program out there to navigate through the jungle of podcasts, but it is what a lot of people consider the best. If you have an android phone, there are plenty of podcast apps out there but we recommend Stitcher. You can find RealLife English on Stitcher here (and download the App). Nice summary to start learning languages through podcasts. This is also an AMAZING and free site for learning languages through songs…. I am a regular user of podcasts as a Itunes subscriber and have already tried pretty much all kinds of them(ESL podcasts, News, documentaries and so on). My problem is how select a podcasts that suits me, I mean, not something so easy that gets me bored, but not something so difficult (CNN, Fox News, This American Life, for example) that gets me frustrated for not understanding most of what is said. Could you help me, recommending something in between?